Fr. Tom Cassidy | Walk with us! 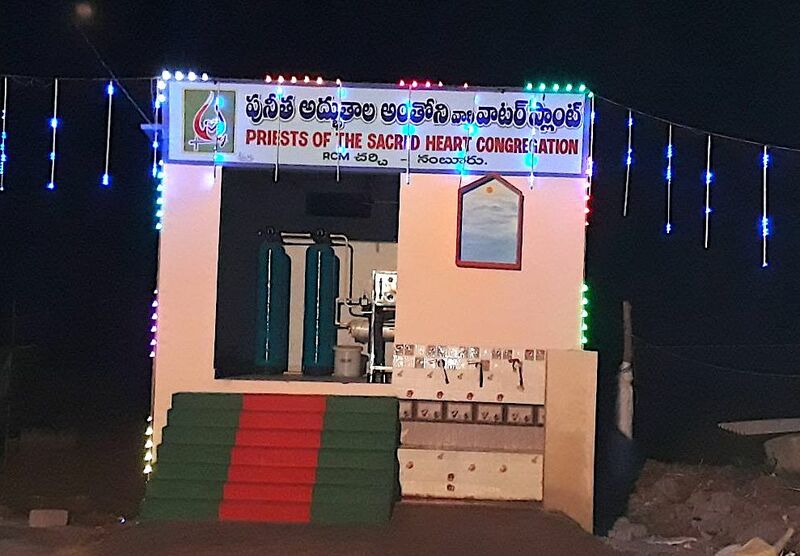 Today we inaugurated the new water treatment facility at Sacred Heart parish in Nambur. It was a gift to the community through the generosity of our North Italian Province. 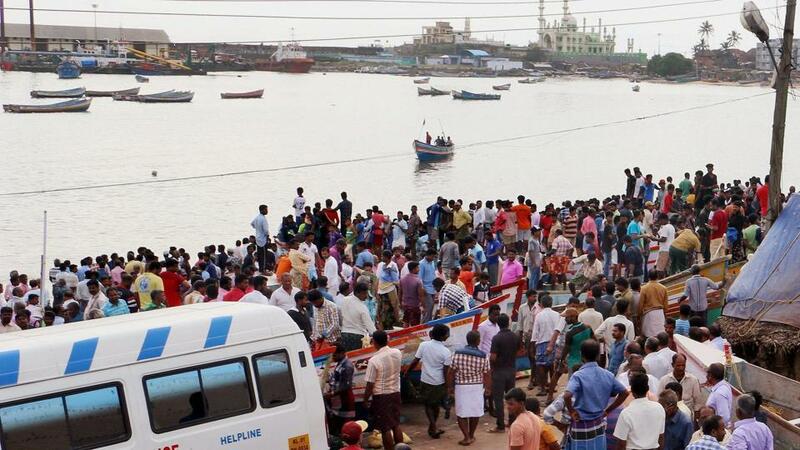 Here in India, fresh water cannot be taken for granted, and with 1.2 billion people and growing, it is and will probably become a bigger issue in the years ahead. Take for example our minor seminary in Gorantla, about a half hour drive from the novitiate and Sacred Heart parish in Nambur. When we opened our seminary it was, well frankly, out in the middle of nowhere, but now all around it apartment buildings are going up and the only source of water is underground. Recently, the seminary had to dig a new well as the old one was fast becoming dry as the water table recedes. I do not know how much, if any planning, goes into the booming construction, but I do hope someone with some clout is on top of just how much population density the water table will support. For the poor of India and the poor of the world, access to clean and safe drinking water is questionable at best. Nambur is a simple Indian village, typical of many in the Indian state of Andhra Pradesh. The installation of this water plant means a lot to those living near the parish church that it is designed to serve. 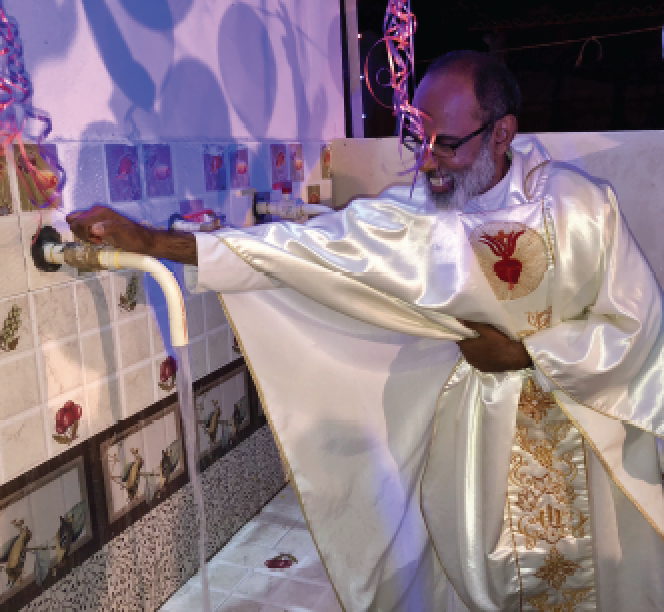 It is a great service that the parish is now able to provide fresh drinking water to its neighbors: Catholic, Hindu and Muslim. In turn, may it help to improve community relationships; time will tell on that score. Special thanks goes to the provincial superior of the North Italian Province, Fr. Oliviero Cattani, SCJ, and his council for approving this project, and in particular, the help of Fr. Beppe Pierantoni, SCJ, who proposed it to the council and helped coordinate it from an idea to the reality we celebrated today. Today is Palm Sunday, also known as Passion Sunday, in which the Church, through its liturgy, reenacts the entry of Jesus into Jerusalem and marks the solemn beginning of Holy Week. This year it also was the day chosen for those brothers in temporary vows to make their renewals. With the renewals taking place at Mass this morning it also marked the end of the vow retreat conducted by Fr. Bala, SJ. I learned the retreat centered on 5 Cs: Compassion, Collaboration, Conversion, Commitment, and Courage. From all that I have heard and seen the brothers found the retreat to be worthwhile and energizing of their own commitment with today’s renewal of vows. I actually got to celebrate the Palm Sunday liturgy twice, as this morning I had it for the Holy Family Brothers at 7:00 am plus the 10:45 am liturgy and vow renewal out the formation house for our brothers. Fr. 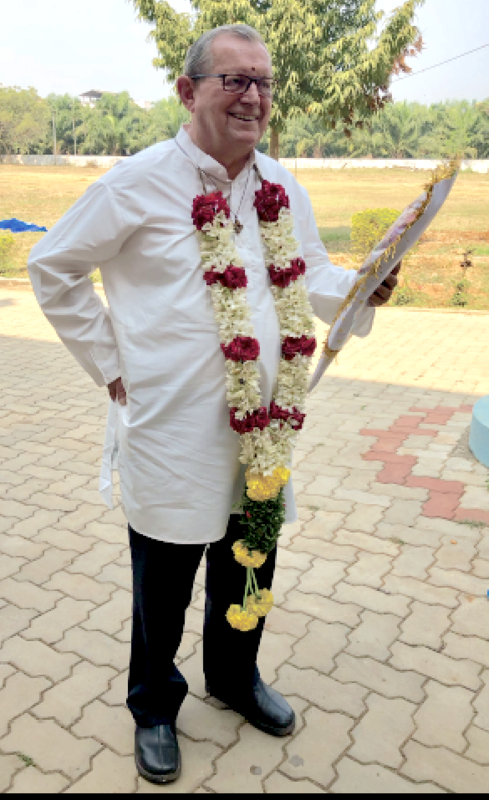 McQueen Winston Savio Mascarenhas, SCJ, our district superior, was the main celebrant and received the vow renewal of our 22 brothers in house plus the 5 regents. Fr. Bala preached the homily as a wrap up to his retreat. India, first in Kerala. It was not an easy task. Fr. Martin was born on December 14, 1935, in Deurne Holland. After ordination in 1963, he became a missionary in Indonesia, spending practically all of his time in the diocese of Lampung until asked in 1994 by Bishop Virginio Bressanelli, SCJ, at that time our superior general, to organize our efforts in India. Fr. Martin died on March 24 in Jakarta. 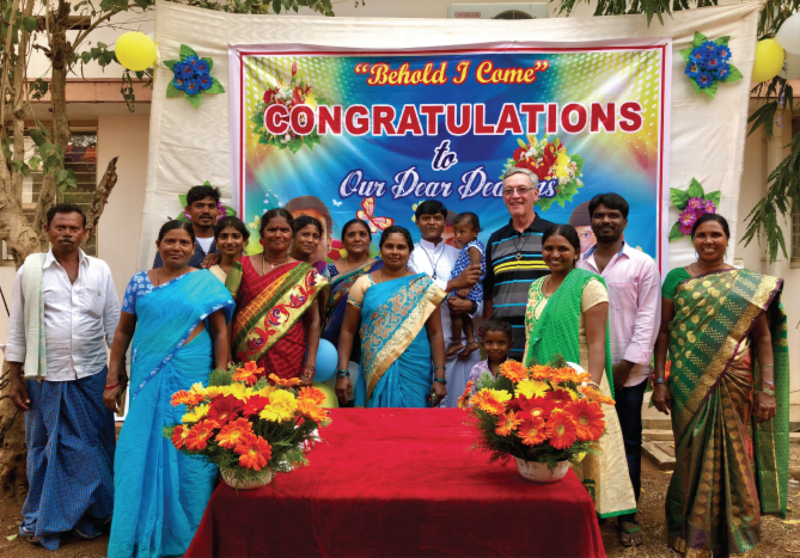 On February 12 the Dehonian formation community at Christu Dehon Nivas held its first annual “Family Day,” welcoming parents and other family members to a Sunday of activities. The SCJs (Dehonians) came to India in 1994 with the express intention of building an Indian community based not on state, language or caste. For many reasons, this is not an easy task; just the sheer size of the country is an obstacle all its own. The vast majority of our professed members or those in formation come from Kerala and Andhra Pradesh, with Tamil Nadu a distant third. 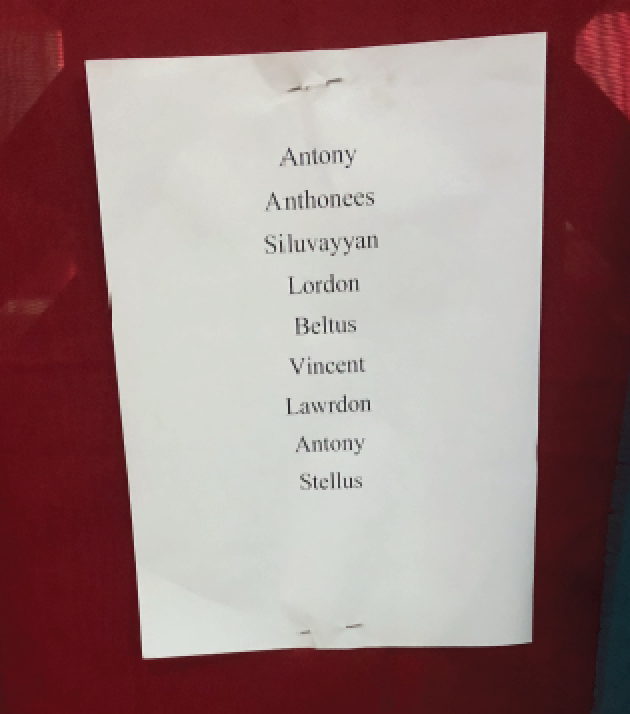 As to where Dehonians work, we have either formation houses or parishes in Kerala, Tamil Nadu, Telangana, Maharashtra (Mumbai) and hope to soon open a new ministry in Goa. Kerala, Tamil Nadu, Telangana, Karnataka and, I believe, Maharashtra, are considered part of southern India, while Odisha, Assam and Jharkhand are in the north. 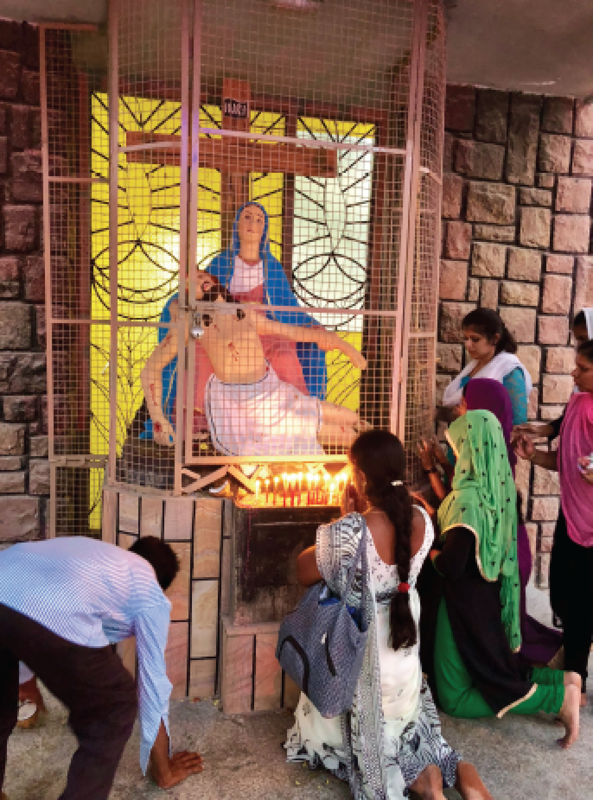 A larger Christian population is found in the south; Hindu fundamentalism is stronger in the north. It is only in recent years that we’ve begun to draw candidates from the north. 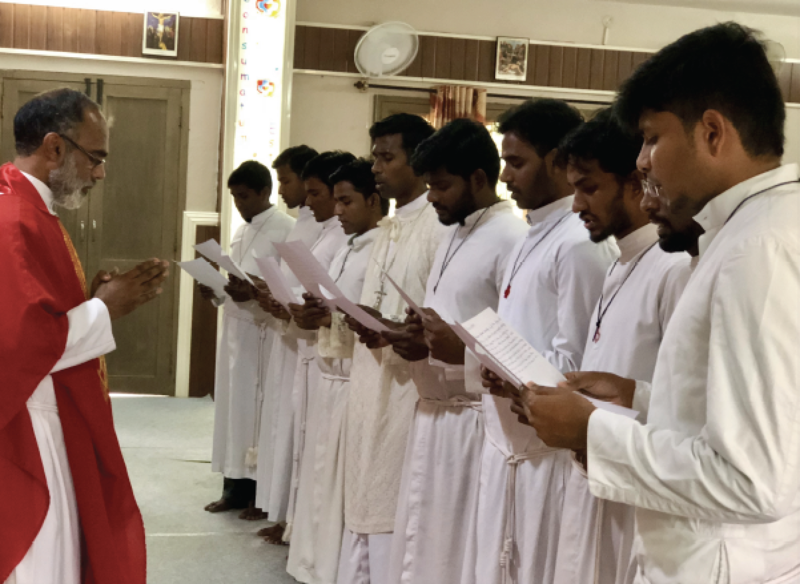 For example, at present in our CDN community we have two brothers from Odisha with three or four more joining the community following their first profession of vows on May 1, 2018. It will be couple of years more before we will see Assam brothers in our CDN community. With the different languages, cultures and castes of each state you have a true melting pot in our Dehonian Indian District, but one that needs constant tending so as to build a sense of common identity. Under any circumstances that is not an easy task given the diversity and character of human nature, but it is possible if attention, nurturing and care is given to create a common vision. If Indian SCJs (Dehonians) are able to do that then we’ll be living our of motto “Sint Unum” (That they may be one) instead of just saying the words. Are we there yet? Not by a long shot. But we’ve only been traveling the road for a few short years. So long as the goal remains clear in our hearts and minds, the “we believe unity to be possible” has a real chance to become our reality. Last Saturday was our second Social Action Day. Br. 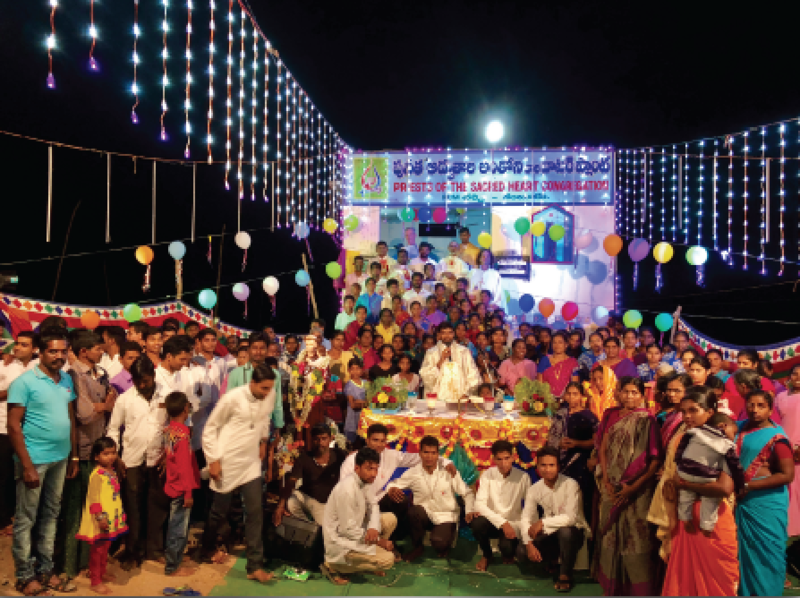 Manish Nayak, SCJ (3rd year student — second from the right in the photo above in a red t-shirt) suggested that his group and others, if they so desired, should help the villagers of Palagudem in the construction of their substation church. Manish and Br. Kiran Kumar Silarapu, SCJ (1st year) have been doing their Sunday ministry in Palagudem. He pointed out that the villagers are poor and were trying to do most of the work themselves. I believe three out of our five student meditation groups agreed to go with him to work on the church. Manish let the kitchen know that those going to Palagudem would not be back for lunch but would be home sometime in the afternoon. The villagers would provide a meal for our brothers. The church construction is in an early stage and the help the villagers desired is what I called the need for “mud slingers.” The task of the day was to prepare the foundation for the interior floor of the church. This meant water and sand needed to be mixed. In some ways it was turning young men into little boys. We all know how young boys love to play and splash in mud! This was a dream come true for our mud slingers. 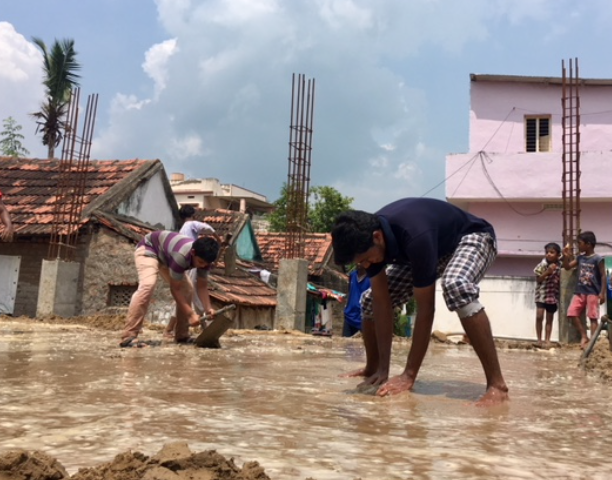 A very common Indian construction technique is to fill a foundation with sand and then force water through it to compact the sand so that when finished the floor will not sink or tilt. Anyone who comes to our refectory at CDN will note that we do have a problem with the foundation sinking on the eastern side of the room. From what I was able to gather the people of Palagudem were very appreciative of our help and especially to see some old faces. Sunday ministry brothers from past years were welcomed and feted as long lost friends by children and adults alike. It was alumni week with fond memories of past times and funny moments of brothers who’ve carried out their ministry to the people of Palagudem. 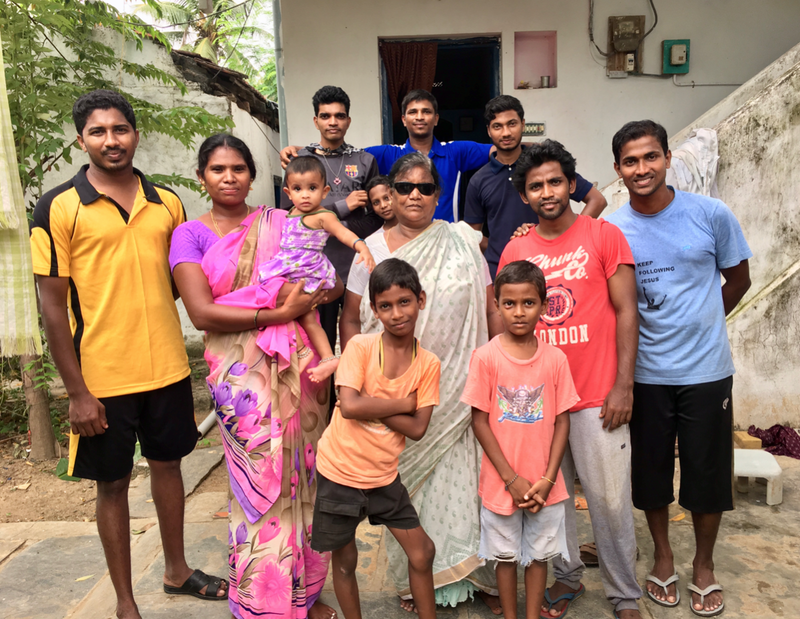 While the mud slingers were working hard under the hot midday sun another group was visiting with the residence of the Missionaries of Charity’s home for the mentally challenged. 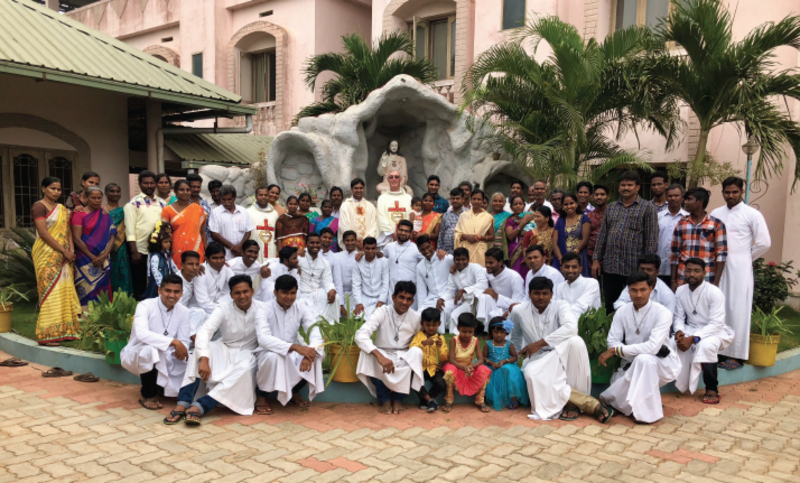 This is a project of the brothers of the Missionaries of Charity who take care of a group of mentally challenged men of various ages and abilities.